Yeah, it’s happening. Lancaster, Pennsylvania’s metalcore pioneers August Burns Red from are no strangers to holiday music. They’ve been releasing holiday tracks since the “Messengers” era with “Carol of the Bells”. 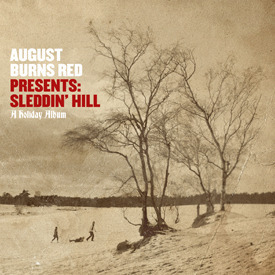 But October 9th will bring “Sleddin’ Hill”, the first ABR Christmas-y full length featuring both holiday classics and original compositions. The band will go beyond their normal range of instruments, including banjos (SHRED! ), violin, chello, various brass instruments, and piano. If anything, it’s safe to say this should be interesting. Just picture a heavy “Frosty The Snowman”. Artwork and tracklist below.